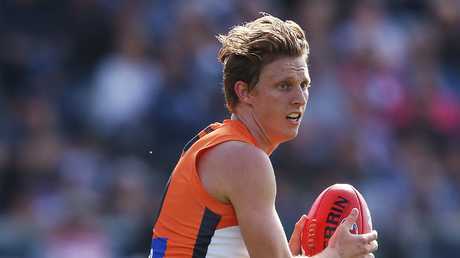 Mark Robinson says Lachie Whitfield has become one of the top players in the AFL. Picture: Michael Dodge/Getty Images. The Tackle: Where is Blues’ next win coming from? Two players are jostling for the title of the AFL's best player after four rounds - Lachie Whitfield and Patrick Cripps. Whitfield was instrumental in GWS' historic win in Geelong on Saturday, while Cripps could hardly have done more to will Carlton over the line on the Gold Coast. Mark Robinson couldn't split the star pair when it came to his likes and dislikes from Round 3. St Kilda, Jed Anderson and Zach Merrett also won praise, but Robbo has Carlton firmly in his sights after it slumped to 0-4 on Sunday. Is he the best player in the AFL? If he's not he is in the conversation. Lot to like about the Giants, such as Jeremy Finlayson up forward and Nick Haynes at the back, but no-one holds a candle to Whitfield. He runs and carries with speed. He plays as midfielder (46 per cent) and forward (51 per cent). Usually the high metres-gained players are the running backs or pure on-ballers. 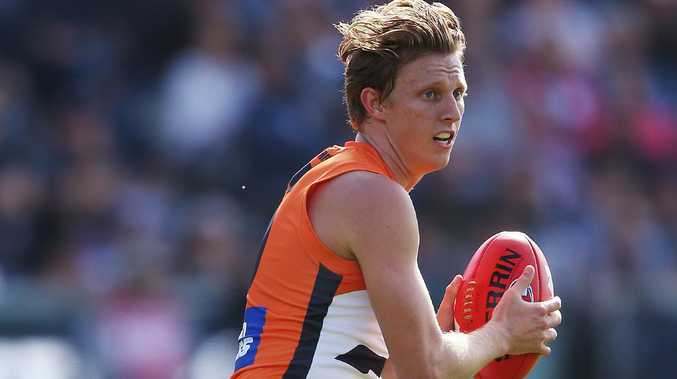 Yet Whitifeld leads the competition with an 678m gained per game, Second is James Sicily (612m), then follows Marcus Bontnepelli (590m), Brad Hill (589m) and Tom Stewart (576m). It doesn't stop there. Whitfield is averaging 34 disposals a game, which is third in the AFL and he averages 6.3 inside-50s, which is fourth overall. They are incredible numbers for his position. 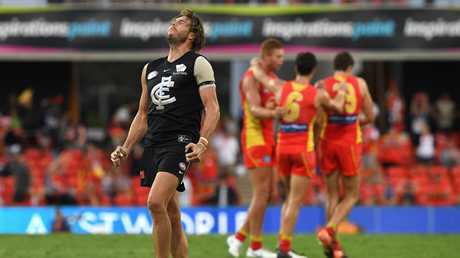 The Carlton skipper was Wayne Carey-like against the Suns, according to David King - "Strapping the team to his back and saying come with me,'' he said - but in the end it wasn't enough for the Blues, who are now 0-4. In an outrageous final quarter dotted by mistakes, free kicks, bad decisions and dropped marks, the Suns won with 10 seconds to play. The Tackle highlighted Jack Bowes for his maturity last week and he kicked the winner after a scrambled play 15m from goal. Once again, Cripps was best afield with 30 disposals, eight clearances and two goals, yet his team came up second. And the Suns? They are one of the feel-good stories of the season. 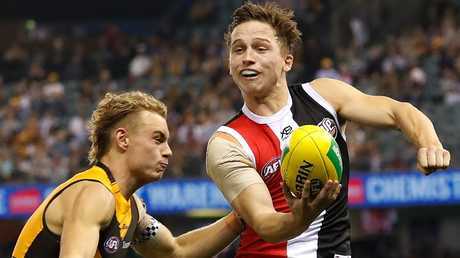 Jack Billings was one of the heroes of St Kilda’s win against Hawthorn. Picture: Dylan Burns/AFL Photos/Getty Images. The 'Jacks' were huge - Billings, Lonie, Steele and Newnes and Sinclair - and Seb Ross was tireless in the middle, yet it was a Callum who will have his efforts highlighted in the review. Callum Wilkie was taken at pick No. 3 in 2018 rookie draft and has played all four games as St Kilda's No. 1 key defender. Just amazing from the 22-year-old. His opponents were a mix Jarryd Roughead and Jack Gunston and in the final minutes of the last quarter he left his man to spoil in a three-on-one contest in the air and on the ground. If he fluffed it, the Hawks probably kicked the goal. The Hawks were done once again by injuries to key players - Ben Stratton (concussion) and James Frawley (hamstring) - but don't know if Al Clarkson will allow that as an excuse. The Saints were cleaner in the big moments, are now 3-1 and another feel-good story of the season. North Melbourne controlled the game from the start by strangling a Crows team intent on committing self-harm in terms of their ball movement. The Kangas, led by Shaun Higgins and Anderson, were aggressive with their running and at the contest. Higgins is an elite player and Anderson is a card-carrying member of the UUA (United Underrated Association). In his first game of the season he had a game-high 13 contested possessions from his 19 overall disposals and led all comers with seven clearances. They are not enormous numbers, but in a strange game they were crucial to North winning. A total team effort from the Tigers. But when the game needed to be won, and saved, it was Tommy Lynch and Dylan Grimes who stood tallest. Lynch stayed close to home all night, his first seven disposals were all scores and he killed the game in the final quarter with several goals. Grimes might be the most respected player at the Tigers and for the past two years the Tigers have urged All-Australian selectors to consider him for a defensive position. And they won't let up. Grimes was enormous against Port Adelaide on Saturday night. He took five contested, intercept marks - four of them in the final quarter. More games like that one and AA is not beyond him. 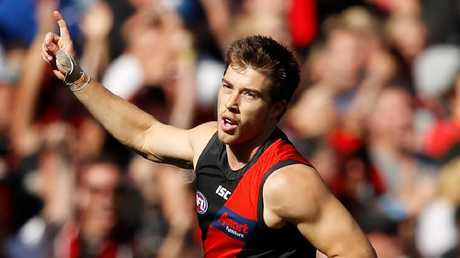 Zach Merrett has found form in the past two weeks for Essendon. Picture: Dylan Burns/AFL Photos/Getty Images. Kudos to Anthony McDonald-Tipungwuti for his seven goals as he was under pressure to perform. So was Zach Merrett. After a feeble pressure effort in Round 1 against the Giants, Merrett has reclaimed his standing in the game. Since 2015 he has averaged 53.2 pressure points per match, which is the 10th most in the league. Against the Brisbane Lions he had 66. He is a wonderful offensive and defensive player when he's able to play without a tag. On Saturday he had 35 disposals, seven clearances and nine score involvements. The problem for Merrett is getting near those numbers when he is against a run-with player. The Bombers have damaging players across the board, but this bloke must be tagged or he will dominate games. Giant Harry Himmelberg's mark with the flight of the ball was Jonathon Brown-esque. It was breathtaking commitment to win the ball and courage of which is rarely seen in the air. Two hours later Port's Willen Drew's mark with the flight of the ball was Nick Riewoldt-esque. He ran and dived to reach the ball drop which was also breathtaking in his commitment. It just so happened that Brown and Riewoldt were commentating that match and Drew's effort drew high praise. "Have we ever seen a soft red head,'' Brown said of Drew. Well, we have but Drew is not one of them. The Demons believed Nathan Jones was being made the scapegoat for Melbourne's poor start to the season so they would be more thrilled than anyone that it was Jones who kicked the goals to wrest control from Sydney. If Jones did it forward, it was Jack Viney in the middle who willed the Demons forward. His numbers were high, as was his impact merely because of his attack on the contest. He is up there with Joel Selwood, Rory Sloane, Nathan Fyfe and Patrick Cripps when it comes to setting the standard at the coalface. 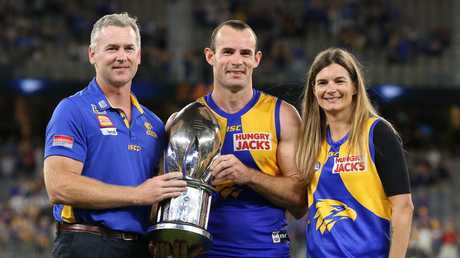 Shannon Hurn was crowned the Ross Glendinning medallist for his stellar performance in the western derby. Picture: Paul Kane/Getty Images. Yet another Ross Glendinning medal for best afield. The West Coast skipper has started this season how he ended last season. And now that the All Australian selectors have declared the AA captaincy to be legacy award as well as seasonal award, Hurn surely is in line to cap his career with the honour - if he stays fit. He's 31, has played 251 games still manages to knock up 30-plus disposals on a back flank. The Crows have hounded the "dislikes'' this season, but Saturday night's performance against North Melbourne was the worst. Rancid, unimaginative, boring, pathetic - take your pick to describe them. Coach Don Pyke was stunned after the game and skipper Rory Sloane was dumbfounded about why his team played safe, slow, uncontested and backwards football. They had the ball in their hands in their defensive half 74 times, they turned it over in their defensive half 36 times and only had 14 inside-50s. You can blame Tex Walker and Josh Jenkins all you like, and they do need to have more impact, but also blame everyone else. The coach's game plan for one. Did the players ignore Pyke's instruction to move the ball quicker and take risks, or did they follow the game plan and play losing football? The score flattered the Crows. They deserved to lose by 10 goals. It's crisis time at Adelaide. 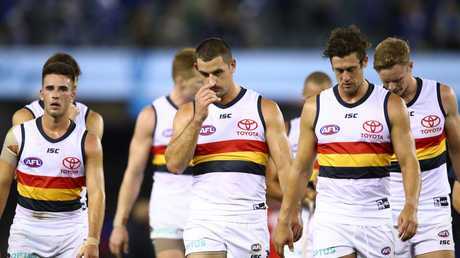 Adelaide trudges off after a horro outing against North Melbourne on Saturday. Picture: Scott Barbour/Getty Images. The AFL is not to blame for everything bad. The new rules seem to be the answer to everything wrong with football, but it's not the case. The scoring is down because coaches have employed keepings-off tactics. It's a tactic which has been there for forever, but it's more pronounced this year as teams play safe football in their back half to avoid turning the ball over. Coaches don't care how the game looks, and that's OK, but we don't have to like what they are doing. Friday night was a snooze for three quarters as Collingwood and the Bulldogs took 213 marks for a score 78 to 64. In the Roos-Crows game, the Roos took 120 marks and the Crows 109 for a score of 71 to 59. In the Dockers-Eagles game, the Eagles took 135 marks to the Dockers' 81 for a score of 69-56. GWS took 113 marks and scored 79 points. Coaches tactics are dictating how the games are played, not the rules. Some of the football being played is mind-numbing to watch. Maybe "keepings off'' is the growing trend in football and maybe the umpires have caught on. Their favourite call at the weekend was "play on, not 15m''. Up by almost four goals in the third quarter but they lost their composure in the final quarter. The Blues deny they have "forgotten how to win'', but Sunday's performance doesn't help their argument. The media caravan will roll down Royal Parade today and once again questions will be asked of the coach Brendon Bolton and the players. A win yesterday would have quelled the unrest among fans. But it didn't happen. If they can't beat the Suns, the most inexperienced team in the competition, just where will the next win come from? Unquestionably, it is a test for all at Carlton, from the president down. Carlton blew a golden opportunity to end its drought against Gold Coast. Picture: AAP Image/Dave Hunt. The "Toby Greene'' rule was brought to stop players raising their boots in marking contests. But that is exactly what happened when Eric Hipwood flayed his boot in the face of Essendon's David Myers, who was front and square to the marking contest. Myers left the field with blood streaming from his face and you could clearly see a stop mark between his eyes. It could have been much worse. 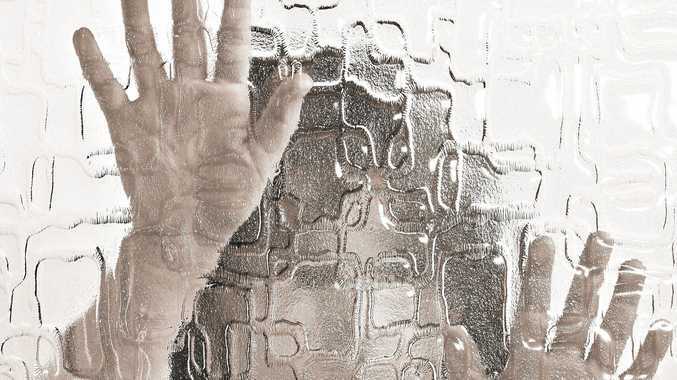 Inconsistency of adjudication is a major problem, be it studs up or prohibitive contact. No wonder fans are confused. Commentator Mark Riccuito didn't like the Hipwood manoeuvre. ''It was an abnormal action from Hipwood,'' he said. Talk about inconsistency, Gold Coast's Wil Powell was concussed in a dangerous tackle and his match was over, yet no free kick was paid. He must be an annoying bugger. He got under Dustin Martin's skin last week and Patrick Dangerfield's this week. Dangerfield will be scrutinised for his hits on de Boer off the ball. Expect a fine for both swipes, the elbow and flailing arm, but who knows if "potential to cause injury'' will be applied. What we do know is they were deliberate acts so a penalty is coming. De Boer is now the No. 1 tagger in the competition, having curtailed Martin last week, then Tim Kelly in the first half on Saturday and Dangerfield in the second half. Against the two Cats he won 13 disposals to their 10. Matt De Boer puts the clamps on Geelong’s Sam Menegola on Saturday. Picture: Michael Willson/AFL Photos/Getty Images. Headquarters continues to back in the warning system for infringements to 6-6-6 ruling. Why? The players aren't schoolkids, they are full-time footballers who should know the rules. Cats coach Chris Scott is in favour of the warning system, but he would be in the minority. And what of the hot prior opportunity? Hawthorn's David Mirra was pinged late yesterday for falling on the ball, and when tackled by two St Kilda players, he couldn't get it out and Jack Lonie kicked the matchwinning goal. She's a tough old game. 7. WHY WASN'T GRUNDY IN DERM'S VOTES? This is not a dislike, this is intriguing. Dermott Brereton didn't give Brodie Grundy votes on Friday night. That's his call and can't wait for the coaches votes today or Brownlow Medal night to see what eventuates. You could argue Grundy had the most impact of any player in the contest/stoppages. He had 23 disposals and a match-high 18 contested possessions. He also had 58 hit outs, 17 of which were to advantage and 10 of which were to disadvantage. The Pies scored 5.6.36 from stoppages to the Bulldogs' 4.0.24. Derm wasn't backing down yesterday. "Thought he was excellent, but I didn't think his ruck dominance translated to the equivalent in Collingwood's clearance dominance. He kept dropping his wining hit outs close in and for pure rucking dominance the Doggies got a 'good read' on him,'' he told the Tackle. For what it's worth, I would have voted Grundy 3, Bontempelli 2, Phillips 1. 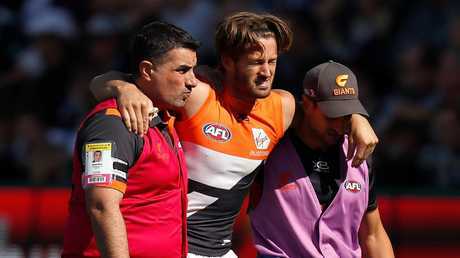 Callan Ward is helped from the ground after suffering an ACL injury on Saturday. Picture: Michael Willson/AFL Photos/Getty Images. was so, so sad. To try to understands what he means, just note how some of his teammates were in tear after the game.